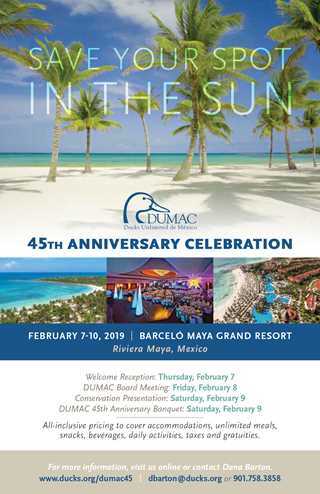 Join us for the DUMAC 45th Anniversary Celebration! Please contact Dana Barton at 901-758-3858 or dbarton@ducks.org with questions. All inclusive pricing to cover accommodations, unlimited meals, snacks, beverages, daily activities, nightly entertainment, taxes and gratuities. Anthony J. Padgett, Ducks Unlimited's 2008 Artist of the Year, will conduct an interactive art demonstration at various times during the DUMAC event where attendees will have the opportunity to leave their own brushstrokes on the artwork. The original acrylic painting will be auctioned off during the banquet on Saturday, February 9. This original acrylic painting depicts two blue-wing teal floating in the marsh. For those interested in Painting with Padgett, please contact Dana Barton at dbarton@ducks.org or (901) 758-3858 by Friday, January 25, to book your space.